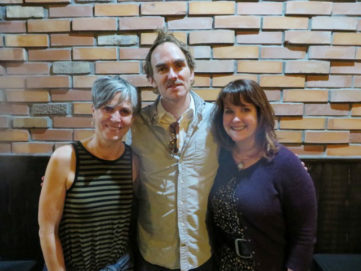 Rain Taxi hosted Tucson-based poet turned essayist (and Whiting Award winner) Brian Blanchfield for a conversation about his new book of “dicey autobiography" Proxies (Nightboat Books). The event was held in the festive new Club Room at the Red Stag Supper Club. 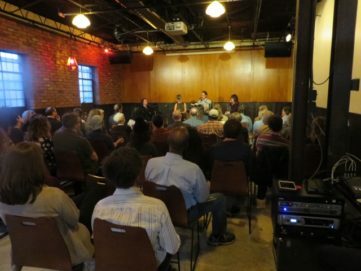 Blanchfield was joined by Minneapolis poets Juliet Patterson and Paula Cisewski, also both poets who are working on autobiographical prose books, for a conversation moderated by Rain Taxi editor Eric Lorberer and peppered with readings from their works. After the event the crowd enjoyed crostini during the book signing, and a splendid time was had by all. The award-winning poet from Duluth, MN presented her new book Rival Gardens: New and Selected Poems (University of Nebraska Press) to an enthusiastic crowd in Minneapolis. 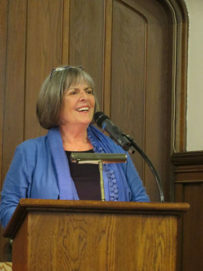 The event was sponsored by Literary Witnesses, with co-sponsorship provided by Rain Taxi and the Loft Literary Center. From left to right (front-ish): Kelly Everding, Bin Ramke, Paul Dickinson, Gillian Conoley, Seth Landman, Ben Kopel, Richard Jackson, Rob Casper, Roseanne Wasserman, Brian Laidlaw, Frances McCue. From left to right (back): Eric Lorberer, James Haug, Dobby Gibson, Donald Revell, Ralph Angel, Steve Healey, Eugene Richie, Dan Chelotti, Matthew Harvey, Betsy Brown, Christopher DeWeese, Guy Pettit, William D. Waltz. Rain Taxi invited over two dozen poets to Minneapolis to celebrate the life and work of James Tate. The gorgeous sunny day, a respite between rain storms, was the perfect backdrop for this momentous, moving, and memorable celebration of a much beloved and missed poet. Because of the enthusiastic response and sheer number of poets, we held two sessions at Uptown Church, with participants reading James Tate's poetry, giving talks, presenting films, and even performing music! Rain Taxi thanks everyone who participated in this amazing reading: Ralph Angel, Betsy Brown, Rob Casper, Dan Chelotti, Gillian Conoley, Christopher DeWeese, Paul Dickinson, Kelly Everding, Dobby Gibson, Matthea Harvey, James Haug, Steve Healey, Richard Jackson, Lisa Jaech, Louis Jenkins, Ben Kopel, Seth Landman, Eric Lorberer, Frances McCue, Emily Pettit, Guy Pettit, Alex Phillips, Bin Ramke, Donald Revell, Eugene Richie, William Waltz, Rosanne Wasserman, and Dara Wier. 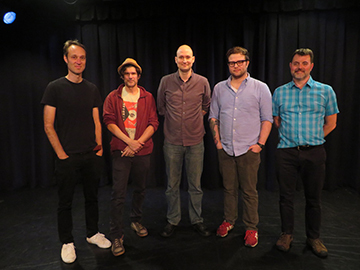 As part of the first Lit Crawl, Rain Taxi invited five local comics artists to present their work to an appreciative yet judgmental audience (sailing on the literary cocktails designed for the occasion by BLB bartenders) for prizes. The fight to the finish included the amazing talents of Will Dinski, Rob Kirby, Anders Nilsen, Zak Sally, and Jordan Shiveley. Salman Rushdie reads to the audience. Photo by Jennifer Simonson. 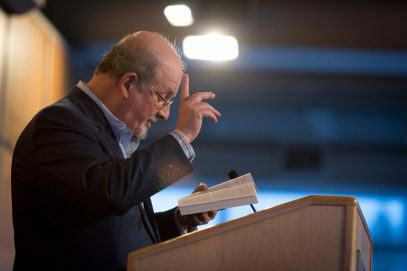 The esteemed Sir Salman Rushdie read to a sold-out crowd from his newest novel, Two Years Eight Months and Twenty-Eight Nights, thrilling the audience with a very exuberant and charismatic reading. Mr. Rushdie took questions from the enthralled audience and stayed to sign copies of this books. A limited edition letterpress broadside of an excerpt from Two Years Eight Months and Twenty-Eight Nights, signed by the author, was printed and is available for sale HERE. Rain Taxi was proud to participate as a Charitable Partner at the 2016 Uptown Art Fair. While art lovers perused the booths, they were able to learn about Rain Taxi's many programs, pick up a free issue, and participate in creative activities like writing What I See poems with poet John Colburn, receiving a Poetry Tarot reading and poem from Paula Cisewski, draw Jam Comics with Ursula Husted, and create erasure poetry. Another great Festival in the bag! See our recap HERE. A lively and moving reading by poet great Laure-Anne Bosselaar wowed the audience at Plymouth Congregational Church. Bosselaar read from new and past work, as well as a poem by her late husband Kurt Brown.